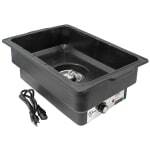 Use this electric water pan from Update International with your favorite chafer stand or as a free standing unit. At 22 in. x 14 in. x 6 in., this rectangular water pan is UL listed and holds pans up to 4 in. deep. One adjustable thermostat provides up to 900 watts of power. 22 in. x 14 in. x 6 in. "This is a great product especially at this price. Well worth the investment. Just make sure that it's the right size for your unit, my unit was a..."
"This is a great product especially at this price. Well worth the investment. Just make sure that it's the right size for your unit, my unit was a bit small so had to adjust it. I just wish it came in chrome. But a can of chrome paint and it looks great."